Vegan olive oil granola spiced with sumac, with a gluten free and nut free base of rolled oats and seeds. This is a great back pocket recipe to have as it fits well with just about any fruits, at any time of year. I know a lot of people are hanging on to summer as we head into late September, but since it’s been autumn here since June, I’m digging it. The local tomatoes barely grew anyway, and the ones that did tasted like nothing – give me some pumpkin! and beets, carrots, grapes, apples! Local apples are a while off yet but I did eat a windfall apple the other day and it was just perfect. It was so cold all year that the autumn vegetables are already doing well. I think it’s a lot easier to appreciate what’s available for shorter periods of time when you really try to only eat seasonally. I get so excited every time I see something new at the market or shop and try not to jump ahead of myself in terms of what’s growing locally. What’s the point, when seasonal produce is so much tastier and cheaper anyway? 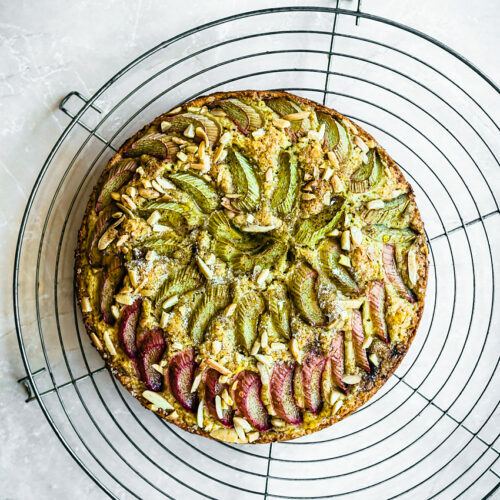 By the way this recipe does not use produce BUT it sure combines well with fruit. 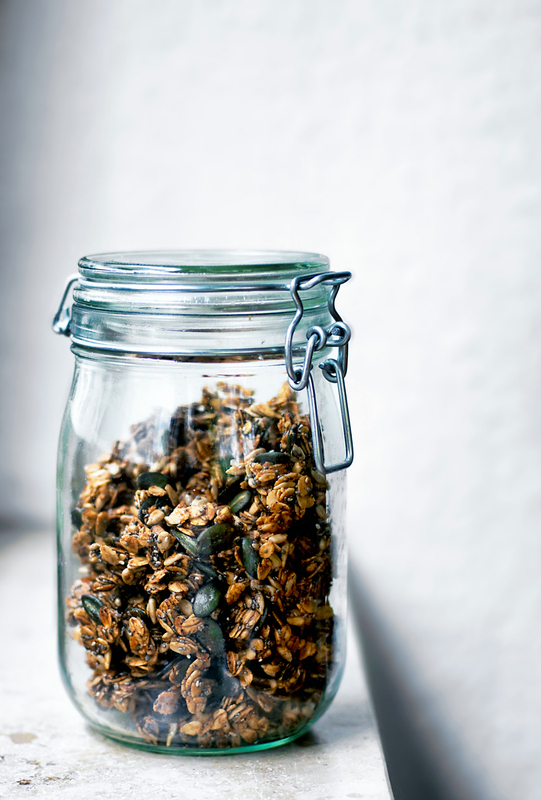 Continuing with this staple/everyday recipe theme I’ve been doing lately, here’s my very favourite granola recipe! This is another recipe I make about once a week on my batch cooking day to have for snacking throughout the week. I first made this olive oil granola a few years ago because I was out of coconut oil but it became my standard over time, and I just switch out a few add-ins and spices depending on the time of year and what I’m doing with it. 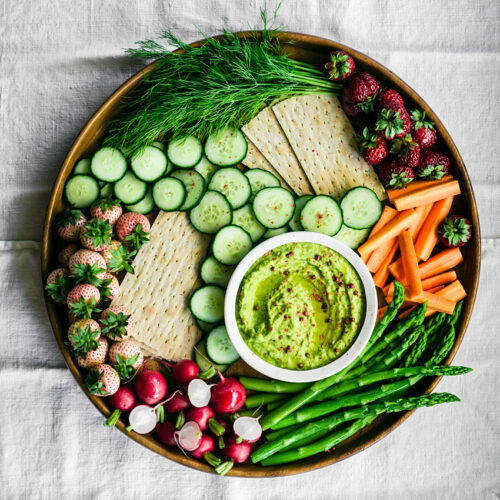 It’s a really inexpensive recipe using olive oil and seeds instead of pricier ingredients like nuts, and I prefer it as an everyday snack over really nut-heavy recipes. If I’m giving it away as gifts sometimes I’ll mix in some nuts and a few sweeter spices to fancy things up a bit. 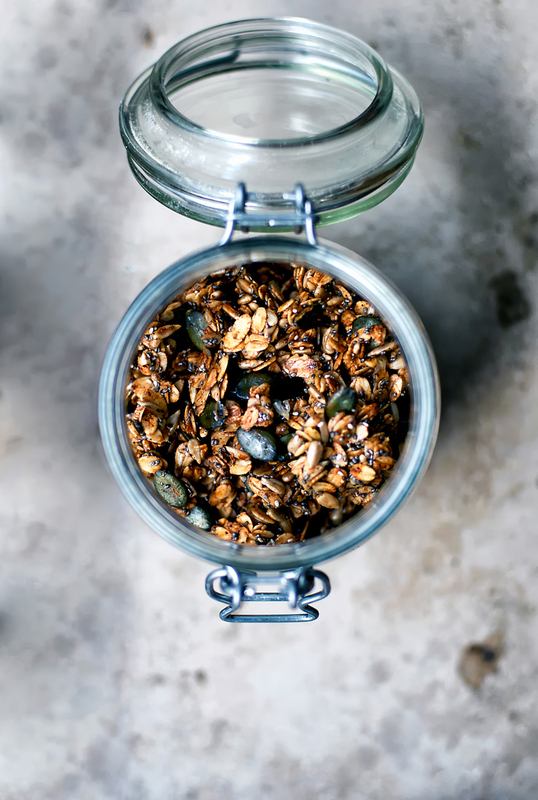 If you want a granola recipe that calls for coconut oil, try this one from last autumn, it’s excellent. My standard spice for this olive oil granola is sumac. It’s a citrus-like spice from the Middle East that’s not really sweet but adds a nice popcorn-like flavour to the granola. Really, this granola tastes just like popcorn. Sumac is pretty inexpensive especially if you get it at a Middle Eastern grocer, and it’s great with roasted vegetables, hummus, in sweets, and more. If you don’t have or can’t get sumac (I can only get it at one market here so I often don’t have any), substitute cinnamon, cardamom, nutmeg, or whatever spice you’d like. I’ve made this recipe with all three and I liked it every time. 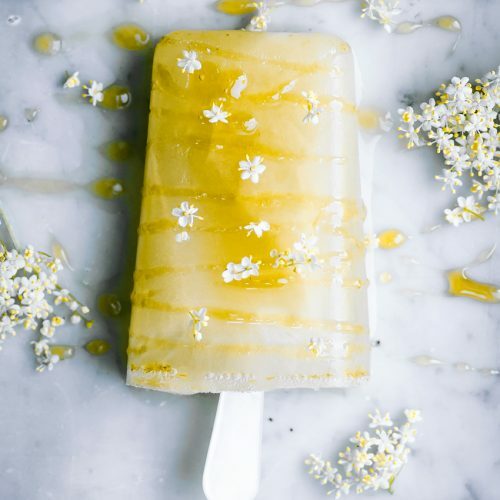 If you’re worried that it won’t be sweet enough because of the olive oil, well, maybe you’re right. It depends on your personal taste. 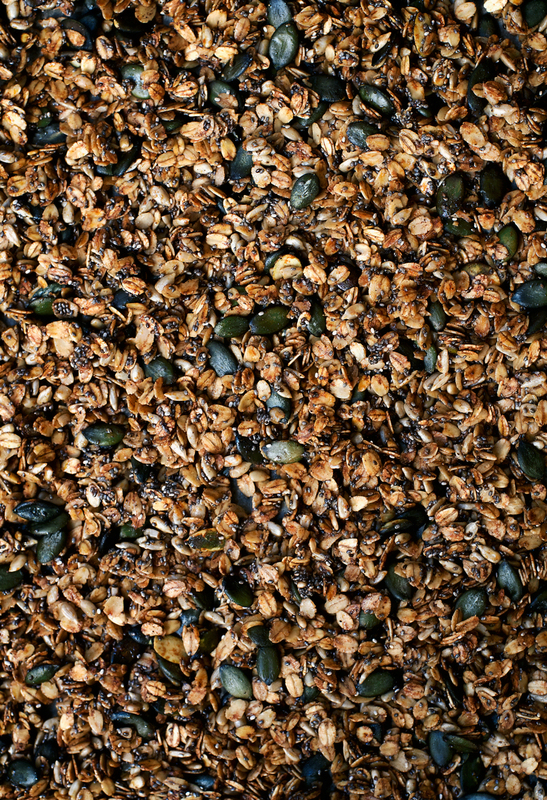 If you like cloying, super-sweet granola, maybe you should head to a different website. 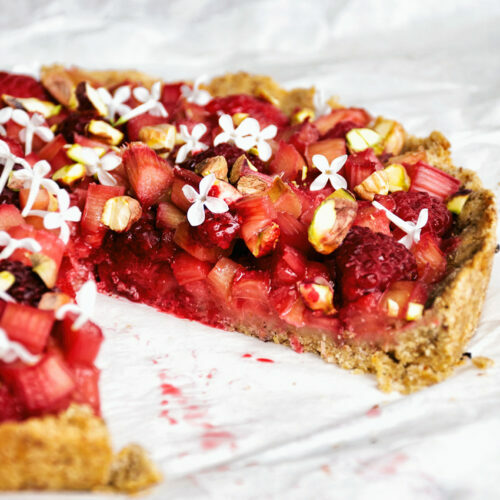 This is just lightly sweet but it’s great to have with fruit as it’s not overwhelming – and the taste is fairly neutral so it goes with seasonal fruits all year round (unlike cinnamon or nutmeg). Vegan olive oil granola spiced with sumac, with a gluten free and nut free base of rolled oats and seeds. This is a great lightly sweet back pocket recipe. In a large bowl, mix the oats, sunflower seeds, pumpkin seeds, chia, sumac, and salt. Add the olive oil and honey, then use your hands to mix until the dry ingredients are fully coated. Transfer the granola mixture to your prepared baking sheet and wet your hands lightly to spread it into an even layer. Bake for 40-45 minutes, or until golden. The granola won't be crisp when you take it out, so just look for colour. It will crisp up as it cools. Place the baking sheet onto a drying rack to cool. Once the granola is completely cool, break it apart and store in a sealed container for up to a week on the counter, or a month in the refrigerator. • I use the standard European size baking tray with high sides. A regular large baking sheet is good, and if you have smaller ones you might want to bake the granola on two sheets. *Alternatively, use a full cup of sunflower seeds instead of half pumpkin seeds. I imagine sesame seeds would be good too but I haven't tried that. ** You can do half cinnamon half sumac, all cinnamon, or a mix or cinnamon, nutmeg, and cardamom. I like it with all three of those spices individually as well. *** I use creamed honey and use my hands to work it in. I find liquid honey can make things a little sticky. Creamed honey makes a bit of a clumpier granola and maple syrup results in one that's quite fine, but both are excellent. Savory granola? Yes, please! I love this idea. I try to imagine a savory spin on most sweets since I don't have much of a sweet tooth, but my mind has never gone to granola. I neeeeed to try this! I make a similar recipe (minus the sumac) with olive oil too, and it's delicious! Sometimes I mix olive oil and coconut oil to extend the smoke point. I'm very curious about sumac, but haven't been able to find any yet, so I'll have to keep my eyes peeled. P.S. Sorry your summer wasn't much of a summer! I've never used sumac but it sounds so intriguing. I'm going to be on the lookout for some! This granola looks so good. I mix them sometimes too but usually I don't want to do the extra step of melting the coconut oil, hah. It's baked at a lower temperature so I like to think it's okay but I know olive oil is a bit tricky with any heat. Sumac is the BEST, you need to find it! It's such a wonderful, flexible spice. I add it to everything from roasted vegetables to cookies! This has become our standard breakfast for the last month! 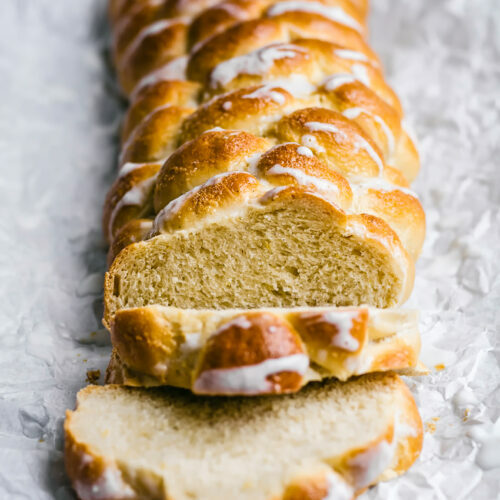 🙂 It's so easy to make, and it tastes so good! I've made versions with sumac and with cinnamon, both delicious! Thanks so much for the lovely recipe! Thank you so much, Daphne, I'm so pleased that you've been enjoying the granola!